It’s tough to run a service business. You know, the kind of businesses most of us are in. Or the kind of positions those of you who aren’t self-employed are happy to find yourselves in. Even the kind of businesses where you sell a product, but it’s wrapped in a lot of service. It’s the same ongoing challenge that has the potential to bring ruin. What’s so difficult you might ask? What can literally take your career or business down? You work too much, for too little. The fact is that unless you’re an attorney or a CPA you probably don’t run time or project management software like Timeslips, Zola, Toggl, Mind42, Rescue Time or others. And as a result you aren’t and really can’t bill clients in that fashion; if you could, today’s tech tools could help solve the problem. Maybe. At least they’d go a long way towards giving you the discipline you need to stop the bad habit that most in our line of business have – unintentionally working for free. Yep, we all do it and we’re really good at rationalizing why we do it. We tell ourselves things like, “it’s ok to do this, it’s ok if I spend this time now, it’ll pay off later, all my peers and competition do it this way, it’s what’s expected.” The bad news is we’re fooling ourselves, and we don’t even address the problem. It’s even worse news when we don’t even recognize that we’re doing it. We steal from ourselves. 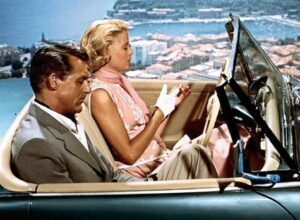 The image here isn’t to have you guessing if they are on their mobile devices, it’s from the movie To Catch a Thief – the glamorous 1955 Alfred Hitchcock movie that reminds me how easy it is to have things taken from us right under our nose. Time is like that. As you know if left unattended it disappears. While they don’t realize it, clients “buy” your expertise measured in blocks of time and you are always constrained by the number of hours in a day. Within reason, everyone has the same number of hours – the earth moves around the sun for everyone at the same rate. I’m not telling you anything new when I suggest that you need to operate like time is a product and not have people stealing from you. I’m not even enlightening you to the fact that the problem is you’re probably stealing from yourself – you’re the one doing the stealing. But I am sharing that I have to remind myself of the potential for thievery all the time, and maybe you should too. Fact is when we don’t pay serious attention and give our “product” away, we are the victim. It’s not easy. But you can stop the flow of stolen “goods” by having the discipline to track your time. You can do it to whatever degree you are comfortable, but the more detail the better. I guarantee you’ll be surprised at what you see and you might even be freaked out enough to do something about it. I suggest you start tracking your working time as simply as possible by coming up with just a few categories of where you spend your time and then tracking those things in 15 to 30 minute increments. If you do that for a week, you’ll know how to make adjustments. Do it as a habit and you’ll become ruthless about it and the result is you’ll either make more money or have more time to do non-work activities. It’s not my opinion. It’s a fact. But don’t expect that you’ll read this, be motivated to stop stealing from yourself and be fully reformed. My experience is that you’ll be religious about tracking at first, followed by being pretty good at it, which is soon followed by a feeling of “knowing/not needing” so you’ll stop. That’s to be expected. Look out for and then recognize the pattern and jump back into measuring sooner rather than later. Your losses will be less damaging. So enough talk, how about a suggestion of how to do it? Pen and paper is easy and portable. And if you email me I’ll send you a simple form. If you like something more technical, check out some of the top apps. It doesn’t matter how you track. It matters that you do track! Good luck with stopping the thievery.